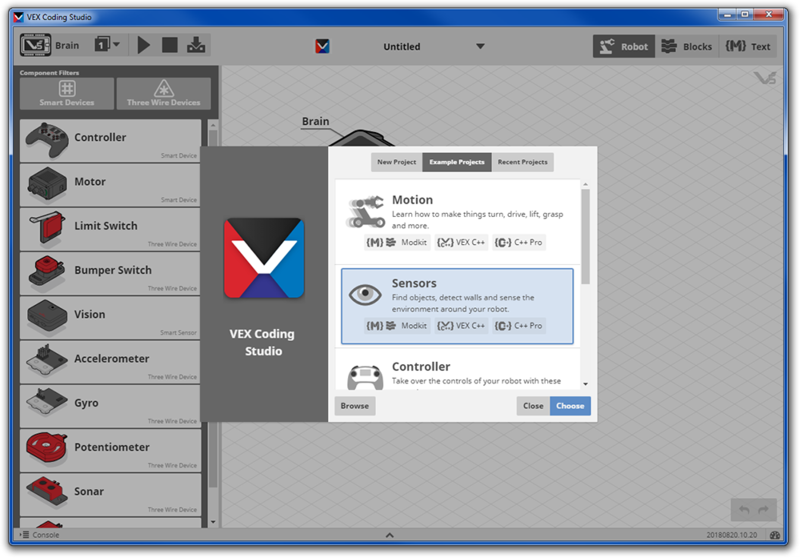 Skip to Step 2 if you already have the VEX Coding Studio's Projects window open because you just started VCS. 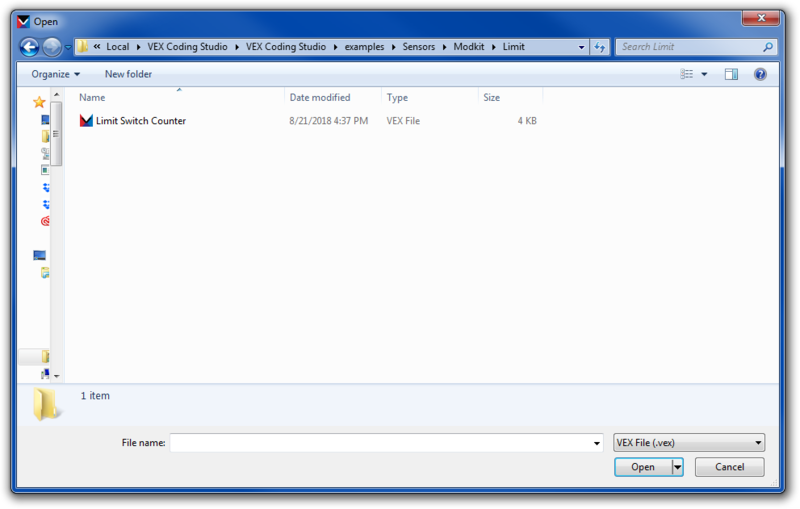 Click the down arrow to access the Project menu if you are at the screen shown above. Choose the New option to open the VCS Projects window so that you can access the example projects. 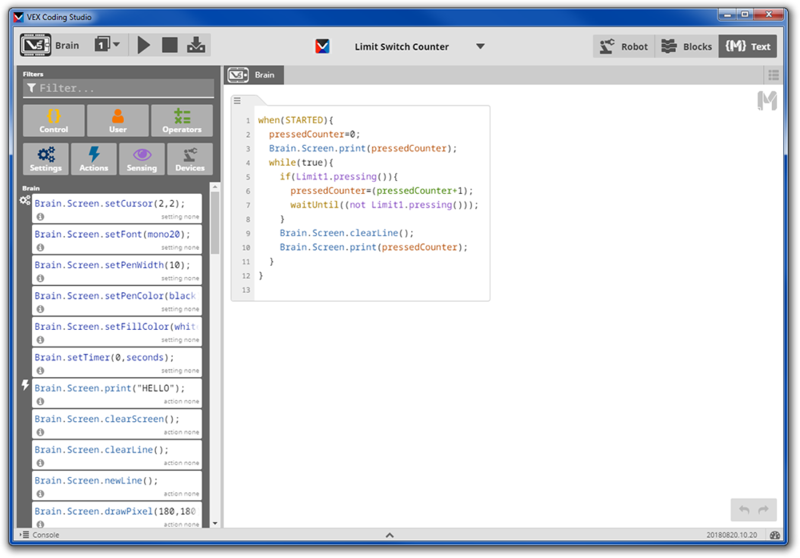 NOTE: Example projects let users see how robotic components can be effectively integrated and programmed. Click on the Example Projects tab to see your options. You do not yet have to decide which programming language you want to use. 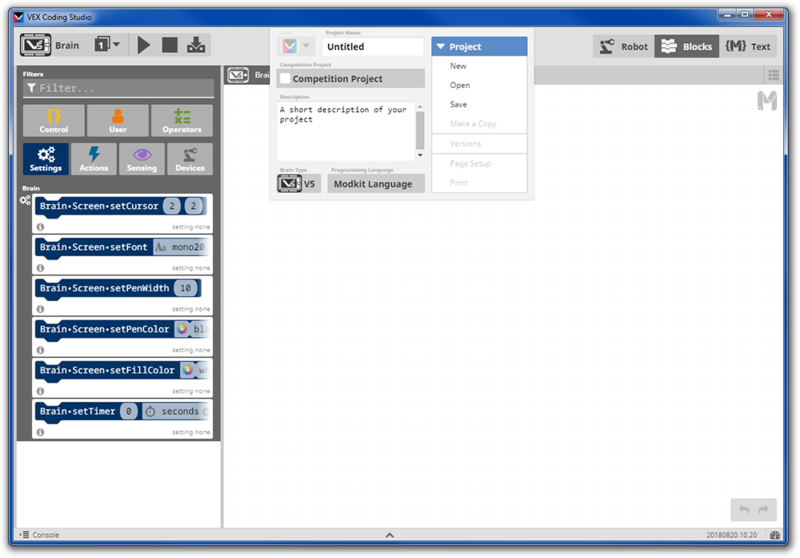 Scroll through the Example Projects options and decide if you want an example of motion-based, sensor-based, controller-based, screen-based, or competition-based programming. Click to highlight your choice, and then click Choose. NOTE: In this example, the user chose Sensors. 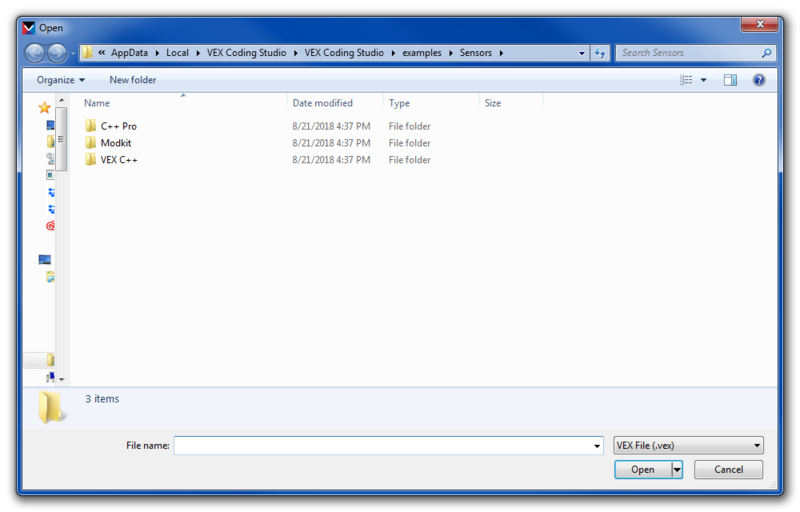 NOTE: After selecting the type of example you want and clicking Choose, a window will open with three folder options - one for each programming language. Choose the language you want and click Open. NOTE: In this example, the user chose Modkit. NOTE: Inside the language folder, you will see folders related to specific components. Those folders are not shown in the image above. Choose the component you want to see featured in the example project. 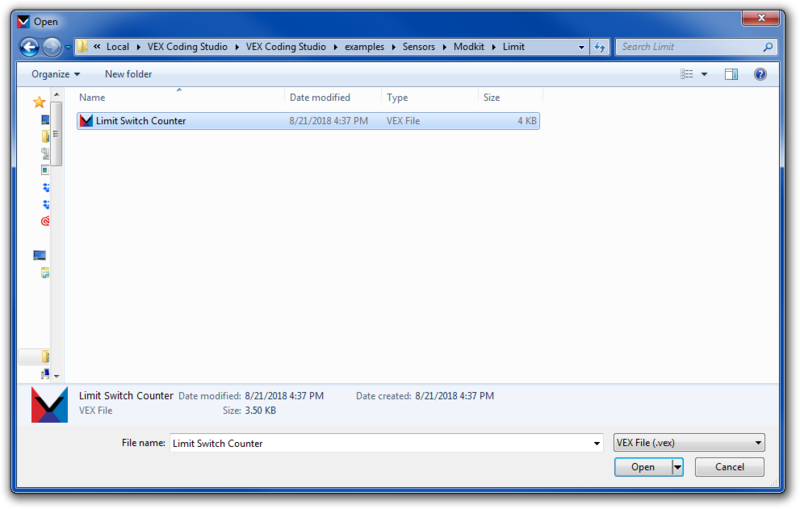 NOTE: In this example, the Limit Switch folder was chosen and there was only one example project (Limit Switch Counter) available inside the folder. Click to select the desired example project. Click Open to see it in VCS. Look at the robot configuration before the programming. NOTE: Each example project has its own configuration. 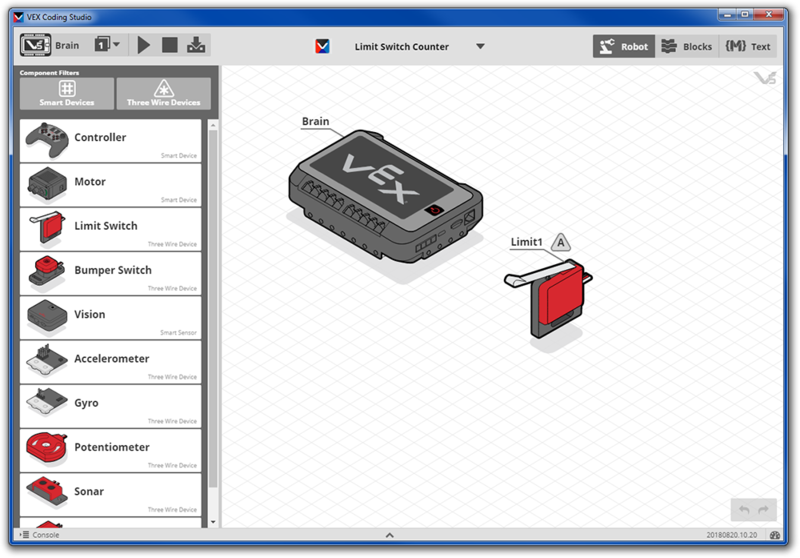 Notice which ports the components are connected to, and any settings that might be chosen for them. Look at the programming and try to draft a flowchart or write pseudocode for what the program does. Pay particular attention to how the program includes the featured component. Test the programming and see how the program met or did not meet your expectations. Take note of how the code affected the robot's performance. 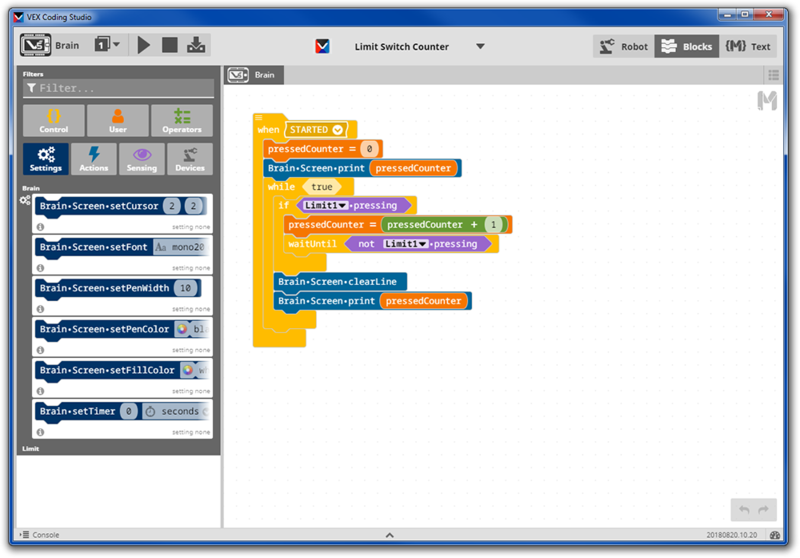 Consider how you might include this component and program it in your own robot build. NOTE: When reviewing an example Modkit project, you can switch between blocks and text views to see in what ways the code looks the same and in what ways the code looks different. Take notes about those similarities and differences. Explain why those differences between blocks and text might exist, and then discuss your reasoning with someone else for feedback.